The Idiot is certainly not music for a sunny day at the beach! It is neither for dancing, nor partying. For driving on a rainy night alone in your car, it is the perfect soundtrack. For someone contemplating suicide, it might be dangerous. The Idiot was on the turntable of Joy Division’s Ian Curtis when he voluntarily checked out. The Idiot sounds like nothing of this earth, yet it is the soundtrack of Iggy’s time in Europe with David Bowie. It is devoid of color, neither black nor white. It is mechanical, ashen, lead gray – a warped, disturbing dream of wartime cabarets, factories, smokestacks, Metropolis, Oedipus Rex. It is murky, dreary, haunting, suffocating and eerily beautiful. When most early synths were being utilized to create mindless Euro disco, Bowie and Pop wrestled those same sounds into submission. Only Bowie could have slowed wild Iggy down to this numbing and anomalous pace. Writing began at Château d’Hérouville where Bowie had recorded Pin Ups and was now working on Low. The Idiot was the prototype for Low, which was also recorded in France, /Germany in 1976. Although Iggy’s album was completed first, Bowie chose to release Low in January 1977, and The Idiot in March, followed by a live tour with Bowie covertly on keyboards. “Poor Jim, in a way, became a guinea pig for what I wanted to do with sound,” “I didn’t have the material at the time, and I didn’t feel like writing at all. I felt much more like laying back and getting behind someone else’s work, so that album was opportune, creatively.” – Bowie, Sound + Vision liner notes. Bowie’s musicians, Carlos Alomar, Dennis Davis and George Murray played on the album, mixed by Tony Visconti in Berlin at Hansa Studio 1. When I walk through the do-wa. I’m your new breed of who-wa. The album cover photo by Andrew Kent was inspired by Erich Heckel’s painting, Roquairol, which hung in the Brücke Museum, not far from Hauptstrasse 155, Bowie and Iggy’s Berlin residence. 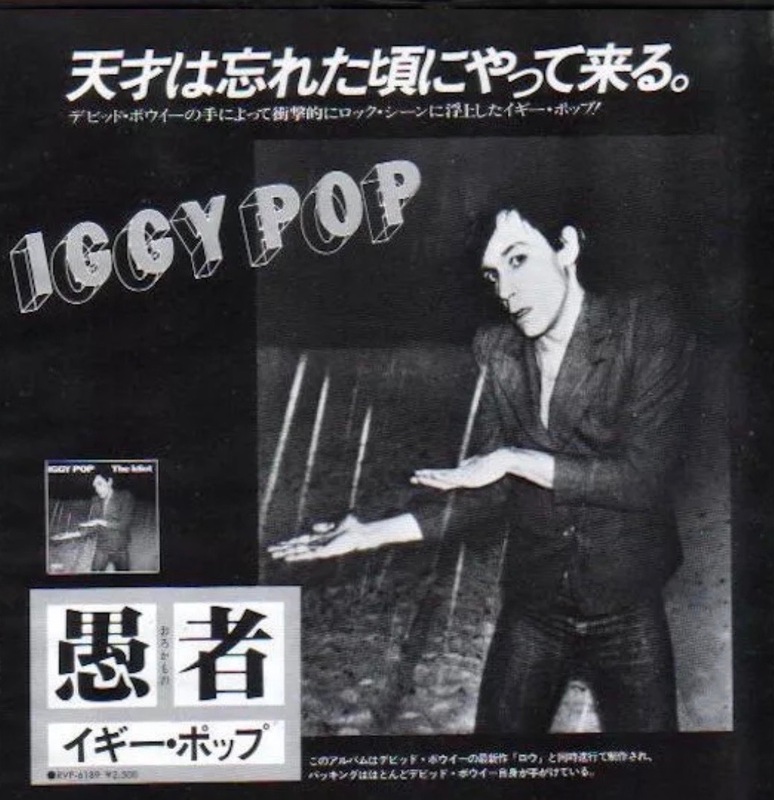 They’d secured the rights to use the painting for the cover of The Idiot, but instead used a photo of Iggy imitating the image. Bowie would also mimic the Heckel painting on the cover of “Heroes” in 1978. The Idiot is admittedly influenced by the sounds of industrialism in Iggy’s hometown Detroit, as was most of The Stooges material. We hear the buzz of mass production, the drone, clang and repetition of machinery – metal on metal. It is relentless, Germanic, anesthetic, hypnotic…hypodermic! Kraftwerk on Quaaludes. Iggy croons two odd, bleak ballads ‘Baby’ with its ‘Street of Chance’ right out of a William Burroughs book, and warbles ‘Tiny Girls’ with sad desperation. Bowie provides a gorgeous, woeful sax solo on the latter. Bowie’s simple sax on ‘Tiny Girls’ is innocently beautiful, adding a touch of warmth to the robotic opus. The musicians borrowed from Bowie’s Low sessions enfold us in reverie, along with Iggy’s ghostly / ghastly crooning vocals. It is seldom that anyone pays respect to former band members in a song (they’re usually happy to be rid of each other). David Bowie had the idea that Iggy should talk about his former band mates on ‘Dum Dum Boys’. Bowie suggested the song title, after the dumdum bullet. On his ode to the Stooges, Iggy pines, ‘Where are you now when I need your noise?’ It was inevitable that the surviving members would reunite decades later, and how joyous it was in 2003 when the Asheton brothers (and later, James Williamson) toured with Iggy again. They are still relevant fifty years on! The hypnotic ‘Mass Production’ with its warped guitar sounds and wonky melody, is punctuated by a factory smokestack whistle. The riveting repetition sends us into a monolithic trance, akin to the enslaved workers in Fritz Lang’s ‘Metropolis’. “Though I try to die they put me back on the line…” The song illustrates monotony in uniformity, and the cheapening of products and people through mass production – conveying the same message as the art produced in Andy Warhol’s Factory. The Idiot was an abnormality, and also a departure from Iggy’s own approach to music, thanks to his friend Bowie. It is one of his finest moments, never to be compared to anything he’s ever done, or to anything at all. 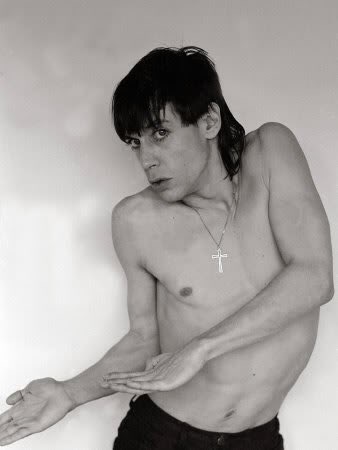 Iggy quickly emerged from the murky depths of The Idiot a mere six months later, wearing a goofy smile on the cover of his next album, declaring a ‘Lust For Life’.